Topics: Get Started, Tips For Property Investors, & Why Mortgage Simple. 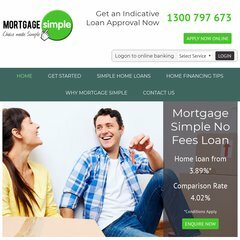 mortgagesimple.com.au Simple Mortgages | All About Us - Low Rate Mortgages | Choice in ..
mortgagesimple.com.au Simple Mortgages | Why Mortgage Simple - Low Rate Mortgages ..
mortgagesimple.com.au Simple Mortgages | Simple Home Loans - Low Rate Mortgages | Choice .. It is hosted by M2 Telecommunications Group Ltd (Western Australia, Perth,) using Apache web server. blaze.awebd.com.au, & ns1.mortgagesimple.com.au are its DNS Nameservers. The programming language environment is PleskLin.